Hurricane Data: The Latest Information On Current Hurricanes and Tropical Storms. Hurricane Trackers, are you ready?? Well, if you're not, don't panic because we have all the current information on the latest storm or hurricane to affect the Atlantic Basin. First, and foremost, we have the latest bulletins from the National Hurricane Center in Miami, Florida. as well as real time audio broadcasts and streaming info. Then, of course, we have the latest visible, infrared, and water vapor satellite imagery from out of the tropics. In addition, we have the latest radar imagery from the coast, and certain areas in the tropics. And of course, we even have the live storm cam shots from the coast. Plotting the storm, or getting the latest watches and warnings? Well, you can access the latest information from the National Hurricane Center. The NHC provides updated storm advisories, discussions, and overall outlooks several times a day, and even more when a hurricane or tropical storm threatens land. They contain the essential coordinates, location, sustained winds, forward motion, and central pressure of the storm as well as the latest watches and warnings. Click the live button below to listen in to our 24 hr a day weather broadcast's. When a major weather disaster occurs Jim Williams will be live covering the event. When Hurricanes make landfall anywhere in the Atlantic basin Jim will be live with special guests & radio simulcasts covering the event, otherwise you will hear our normal programming of weather documentaries & statistics. Satellite imagery of hurricanes and tropical storms can be among the most majestic pictures of weather phenomena you will ever see. Who can forget the satellite images of Hurricane Elena in the Gulf of Mexico in 1985 from the Space Shuttle, or the images of Hurricanes Hugo and Andrew rolling into the South Carolina and Florida coasts respectively. These images give forecasters a look at what is out there in the Tropical Atlantic that could impact the coast down the road. Satellite imagery is probably the most significant tool to assist forecasters since before it came along forecasters had no idea that a storm could be out there other than from ship reports, and local observations. 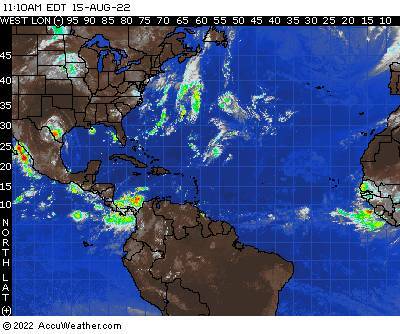 These images are provided by NOAA, and the National Hurricane Center. See the latest tropical storm, hurricane, or even a nor'easter come ashore along the East Coast and Gulf of Mexico by viewing these storm cams. Now you can view landfalling storms in real time. The links to these sites were obtained via the Hurricane Watch section of the InJersey.com web site. If you have any questions about, or any suggestions for this web site., please feel free to either fill out our guestbook, or contact me at gmachos@hurricaneville.com.